Eagle i is the reseller of an industry first: the all in one S3 Super Grouper – which makes sowing, spraying weeds and spreading fertiliser so much simpler. 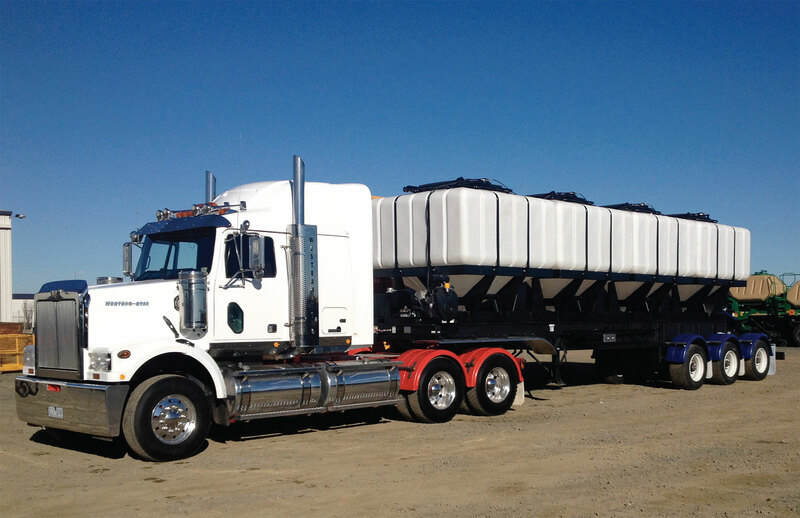 The non-corrosive poly tanks are ideal for transporting seed, water, fertiliser and liquid fertiliser as well as having multiple other uses. 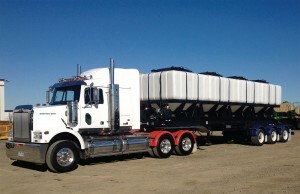 Farmers or fertiliser companies can customise the Super Grouper to suit their requirements. Anyone purchasing the S3 can choose how many 8000-litre tanks they require (one to five), decide on stainless steel conveyor, liquid conversion and wireless remote options. 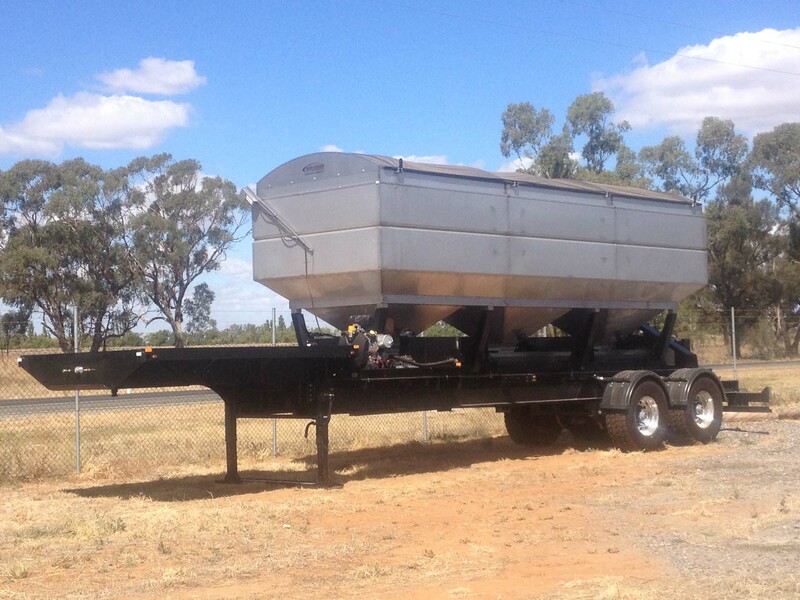 It can be purchased as a complete trailer unit, or buy the grouper to mount to an existing trailer. Once Eagle i helps farmers decide what size grouper best fits their operation. They also have the option of choosing colours, applying company logos or any other customised work. The S3’s non-corrosive poly tanks are an industry first and if liquids are being used there is the option of a liquid kit with each tank. 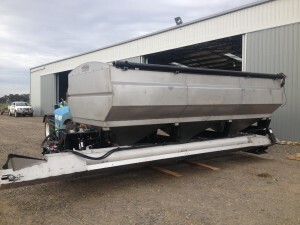 The grouper can be coupled to the truck hydraulics or come with a fully self-contained hydraulic power pack that is powered by a 28-kilowatt Kohler motor. The conveyor system can be made in mild steel or stainless steel. One person can control the grouper all with one simple remote package: fold and lift the conveyor, start and stop the motor, start and stop the conveyor and open and close individual tanks. Sowing – The S3 has conveyors in place so that it enables full clean out of varieties or changeover from seed to fertiliser. 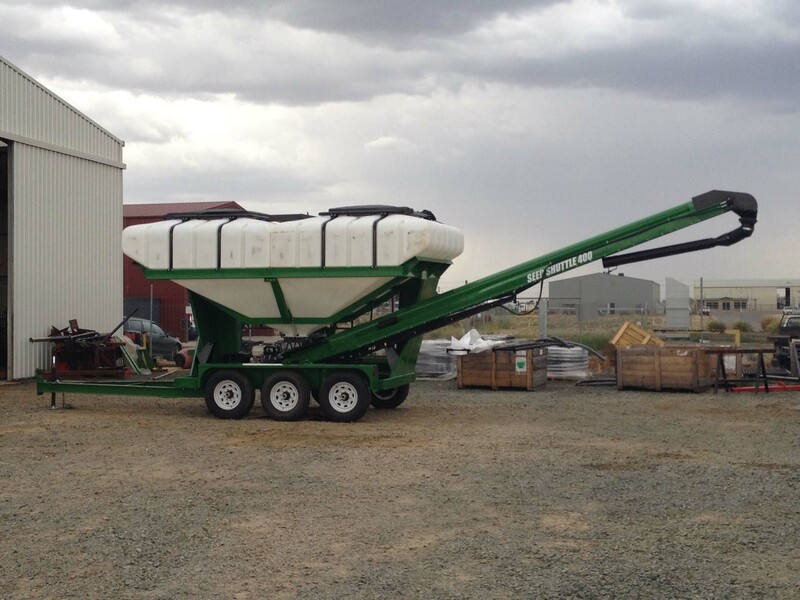 The conveyor extends 7.3m from the back of the trailer and 3.35m high from trailer height to easily fill the tallest of airseeders. 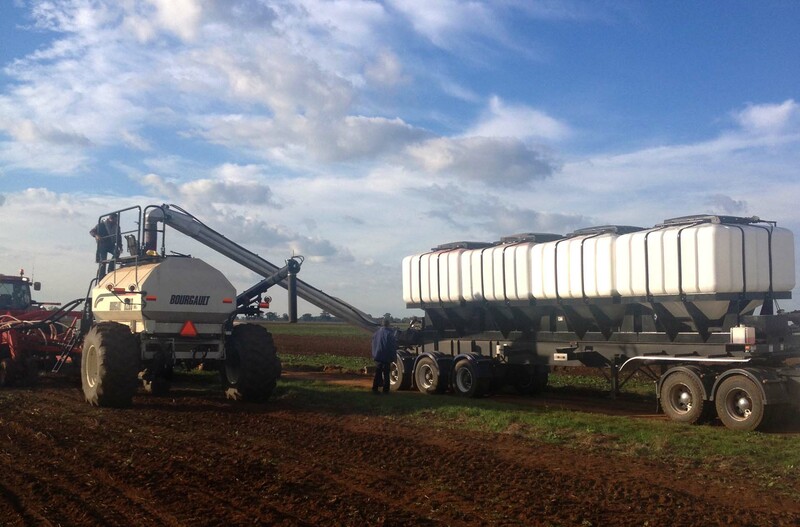 Having the option for liquid fertiliser and water in separate tanks allows for an all-in-one stop for liquid fertiliser application and water or premixed chemical for spraying in the same paddock. 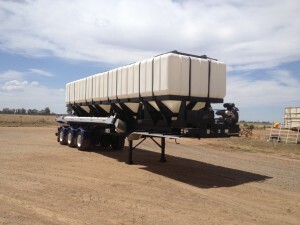 Sowing – Having the capacity to transport the pre-mixed chemical or just water to the boomspray enables efficient and timely spraying. Increase the acres covered per day by having the S3 Super Grouper nearby which will result in better weed control and less labour. 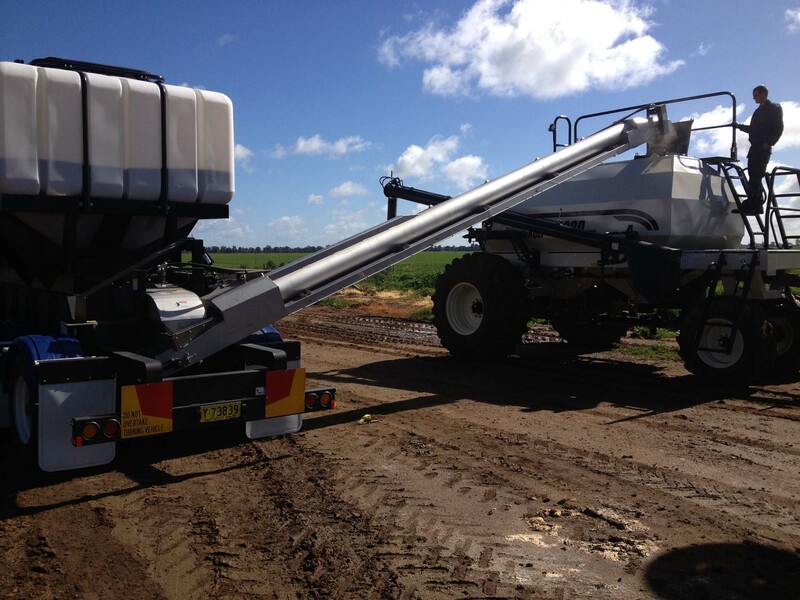 Spreading – Being a fully remote controlled system there’s no need to exit the tractor when spreading – the remote control enables start/stop of Super Grouper motor and conveyor as well operation of the bin doors underneath. 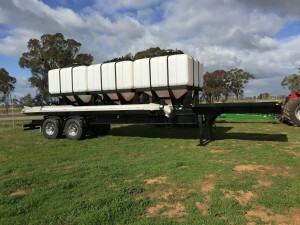 The S3 Super Grouper is suited to broadacre cropping, horticultural operations who use multiple types of dry or liquid fertilisers, livestock operators with different feed mixes or liquid supplements such as molasses, and fertiliser contractors will find the ease of on-farm delivery fertiliser, much more efficient with the use of an S3. 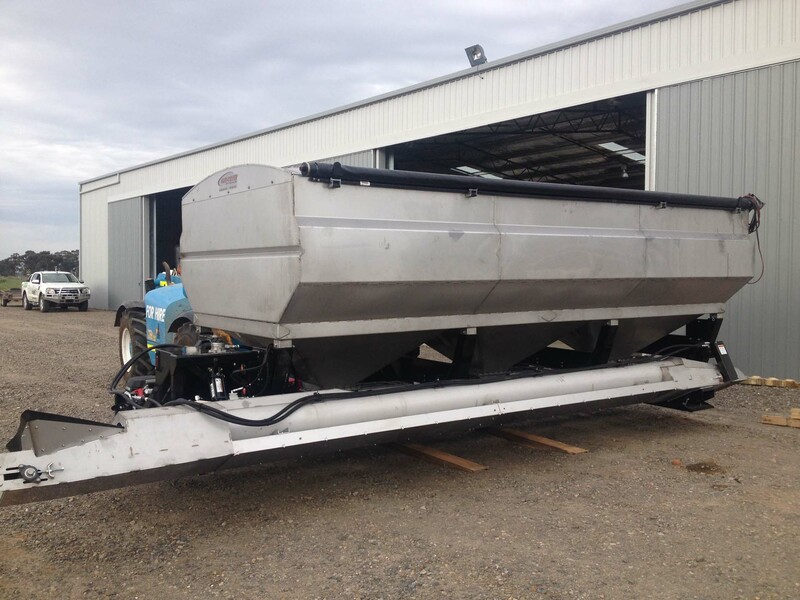 The Seed Shuttle 400 seed tender is a valuable asset to the small to medium farmer when moving grain, fertiliser or liquids. 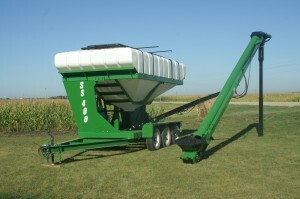 The reversible conveyor eliminates the need for a separate unloading auger. 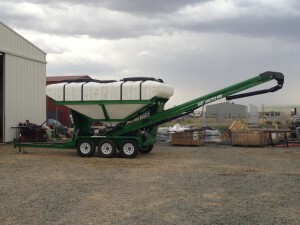 The 7.2m long conveyor has a 20cm diameter and swivels through 180 degrees to reverse direction. 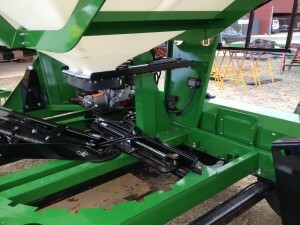 It has side and rear unloading positions, giving extra reach for centre-fill seeders. The two 5,500-litre UV-stabilised, non-corrosive poly tanks are equipped with independent slide controls, 100 square centimetre lid openings, and a wireless remote with infinite belt speed control. Optional extras include a weigh scale, liquid conversion and inoculator kits. The SS400 provides an all-in-one solution for carting seed, fertiliser, water and stock feed. 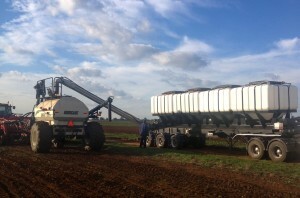 Additionally, chemicals or liquid fertiliser can be pre-mixed in the poly tanks. The 7m trailer can be easily towed by a tractor into areas where heavier trucks may get bogged. Replacements parts are readily available and the machine’s hydraulic drive makes it low maintenance.